Discover a process flow to generate results with a higher degree of accuracy, particularly for Process Plants / Mills. As a tactical mine planner an important part of the role is to continuously improve/reduce the variance between what has been forecast and what has been achieved, actual. While there are many potential parameters which can impact this variation, this post will focus on one, specifically, processing through-puts by rock type. 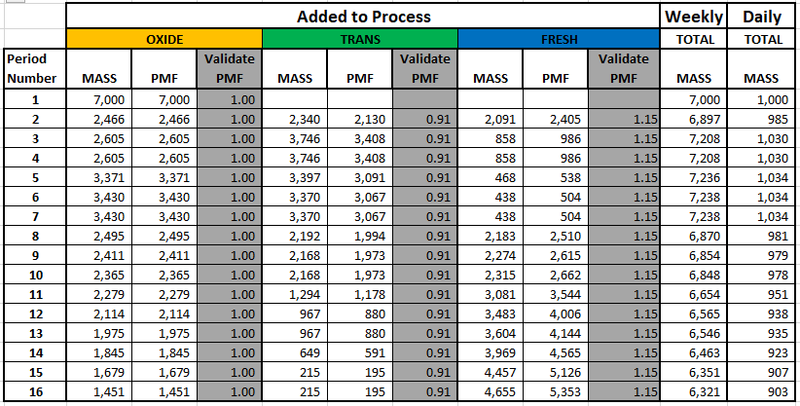 The process mass factor (pmf) represents the mill/crusher variable input rate. This attribute is based on feed rates by material type. The pmf is imported to MineSched as a quality attribute weighted by mass and reported as an aggregate. The PMF parameter can now be used as the Mill units. MineSched will now pull material based on its through-put rate and therefore work at different rates depending on the material. All reporting is also done in MASS. The image below is a validation report showing the final results in MineSched. The final column shows the MASS added to the process on a daily time horizon. Senior Industry Process Consultant, Mining | Michael has been professionally employed in the mining industry since 1987 in a variety of roles comprising time as a production engineer, surveyor, mine planner, business and software consultant. Michael has spent time as a mining consultant carrying out feasibility studies on large scale projects including iron ore and uranium, using a variety of software including GEOVIA Whittle, Minesight and XPAC. Michael has extensive knowledge and experience with GEOVIA software in the fields of process improvement, optimization, mine planning and mine design for both underground and surface.